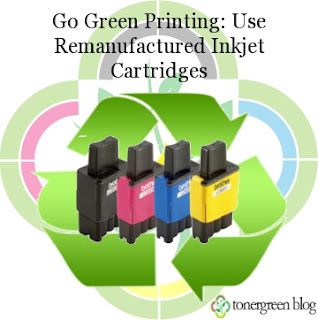 Go Green Printing: Use Remanufactured Inkjet Cartridges | TonerGreen - Eco-Friendly Toners from the U.S. There are many ways to "Go Green" and you can easily start it by doing simple things like changing some decisions on your everyday activity. Don't you know you can even implement the "go green" attitude in the way you print? Yes, you can. And that's by using remanufactured inkjet cartridges for your inkjet printers. We all know that most of us own an inkjet printer in their house and are familiar with its consumable component called "inkjet cartridges". These are the printer cartridges that contain the inks used by your printer to deliver those colored printouts you demand. There are three types of inkjet cartridges in the market: (1) OEM (original equipment manufacturer) inkjet cartridges, those that are produced by the printer manufacturers as well, (2) compatible inkjet cartridges, these are inkjet cartridges made by third-party companies that can be used to replace the original inkjet cartridges in your printer once the inks are all used up, and (3) remanufactured inkjet cartridges, these are used or empty inkjet cartridges that are refurbished and refilled with new ink in order to be used again. Compatible inkjet cartridges and remanufactured inkjet cartridges are probably the best choice if you want to save money; they cut 40-60% of your printing expenses since third-party manufacturers offer them at a low cost. But if you're want to go green while saving those green bucks in your pocket, then remanufactured inkjet cartridges is what you're looking for. These remanufacutred inkjet cartridges are also known recycled inkjet cartridges or eco-friendly cartridges designed and are manufactured with the environment in mind. Remanufactured ink cartridges are not only a great way to join the "Go Green!" revolution, they are also a good way to save that hard-earned dollar. TonerGreen offers a wide selection of US-made, eco-friendly ink cartridges for HP, Brother, Canon, Dell, Epson, and Lexmark printers. All our remanufactured ink cartridges are backed by a 100% satisfaction and performance guarantee that is comparable with what OEM manufacturers offer. So shop now and start saving up to 75%! Perfect post with re-manufactured ink cartridges. This is true that the process is purely Eco friendly and customer can safe their money. After all this is one of the innovative idea for recycle. I want to use your "Go Green" ideology on my work. Thank you for sharing the helpful post with us. Nowadays most of the people are familiar with the consumable component called ink cartridge. We should apply go green printing in which empty inkjet cartridges are refreshed and refilled with the new ink to used again. Really it was the interesting post.